Check out a really cool map of Plone Conference-related hotels and other locations on Platial.com. You can add your own places, how "Web 2.0!" True to our reputation, Seattle in October is cool and rainy. ;-) Expect highs of around 55F/13C and cloudy with showers. Bring a raincoat or umbrella. You will have to walk outside to go to lunch and dinner. Plone Conference 2006 will be held at the Seattle Center's Northwest Rooms, located in the heart of Seattle's Queen Anne neighborhood. It's adjacent to downtown and is steps from a range of accomodations, restaurants, nightlife, cultural attractions and fun stuff to do. This handy map will be part of your conference packet. We'll have ~3Mbps of bandwidth and multiple wireless access points, provided by CCPI, the official infrastructure vendor for Seattle Center. The wireless network will be wide open -- no MAC authentication, no encryption, in order to ensure maximum compatibility and minimum configuration. SSID: Plone. Open source communities like Plone are based on a high degree of trust, and we are of course trusting that you will be "good wireless citizens." ;-) Specifically, we ask that you refrain from streaming video, VOIP calls, or other bandwidth intenstive applications in order to ensure that the network doesn't slow to a crawl. We'll be providing drinks (coffee, water, various other beverages) throughout the day, plus a light continental breakfast (bagels, muffins, etc.) in the morning, and a more substantial snack at 3:00 PM each day. Lunch and dinner will be on your own -- there are many, many choices steps away. A few ideas are listed on the Conference Wiki -- to which you can add your suggestions. Seattle Center is within easy walking distance of a wide variety of accomodations to suit all budgets. We've reserved blocks of rooms at several hotels that are offering reduced rates for Plone Conference attendees. Follow the instructions for each in order to get the discount. 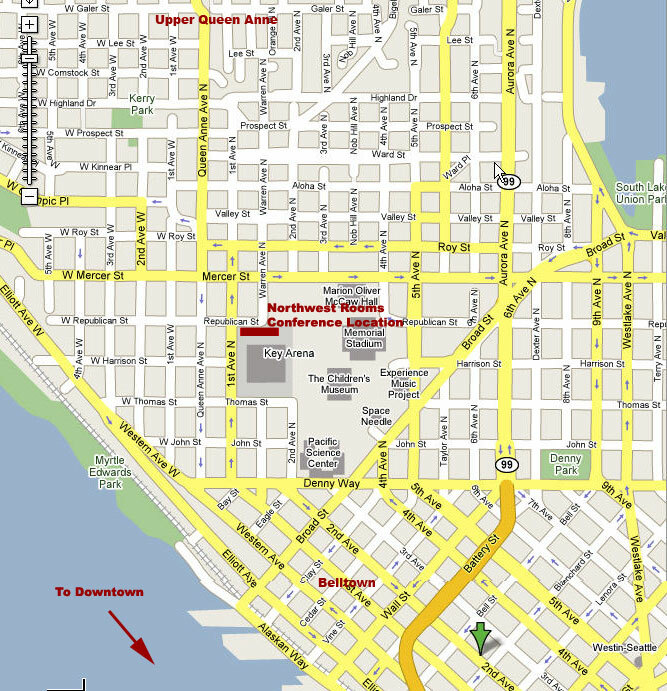 Both hostels are located in the heart of downtown Seattle, a short bus ride (or a ~20 minute walk) from the conference venue. Tourism is way up this year in Seattle, so even though October is normally something of an "off-peak" time of year, our hotel contacts are strongly advising people to book now. Seattle is served by Seattle-Tacoma International Airport (aka "SEATAC", airport code SEA), which is about 10 miles/16km south of downtown Seattle. Seattle is still in the process of building light rail to the airport :-(, but we have an oustanding bus system that offers express bus service to downtown via route 194. To reach the Seattle Center area, you will have to transfer downtown to routes 15, 18, or 2. There is excellent bus information at http://transit.metrokc.gov. Or, if you prefer a slick Google interface, check out the just-launched Google Transit. Taxicabs are plentiful and cost about $30 one way. This map of downtown bus routes is very handy if you want to catch a bus for a short hop to downtown or nearby. Visa Waiver Program - Folks from 27 countries (mostly Europe, Japan, Australia, New Zealand) don't need visas to enter the USA, so long as they have machine-readable passports. Read the fine print closely to see if your passport qualifies. Visitor Visas - Folks not from the 27 countries that qualify for the Visa Waiver Program need a visitor (B-1) visa. They're not too difficult to get, but you should take care of this early. If you register for the conference, we can happily provide you with a letter confirming this fact.